This is Fledi, a much loved 19 year old cat. He lived in Germany. 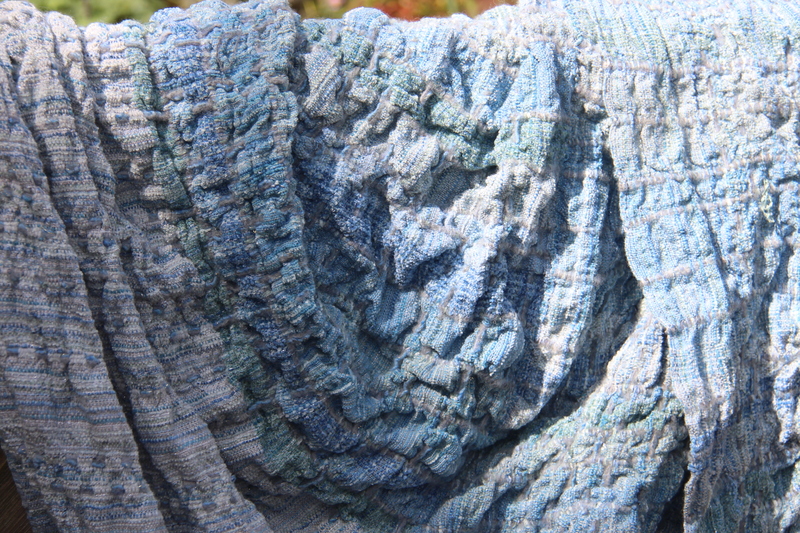 I never met Fledi but I have grown to love him through a textile I wove to memorialise him. 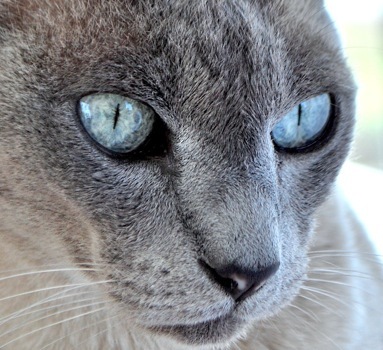 Fledi’s owner contacted me late last year to enquire if I might be able to create a textile based on the colours of the handsome cat’s beautiful blue eyes. I replied that I would certainly give it a go and it has led to one of the most satisfyingly creative exchanges of my weaving career. 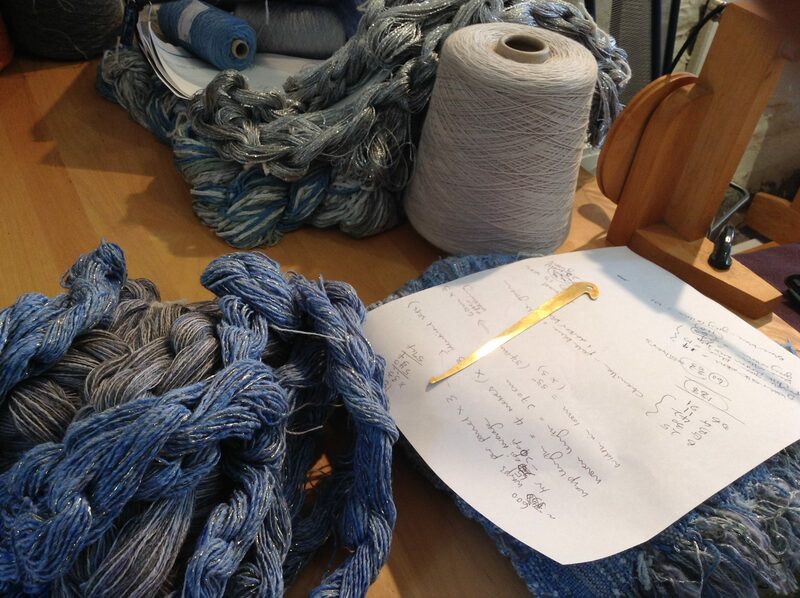 Here is the story of how we wove Fledi’s eyes into a textured throw. Where to begin? Colour was the key. I took this photograph and a few others and enlarged them on my printer. From my stash I pulled out all the colours which I could see in those remarkable eyes. The more I looked the more I realised there was an infinity of tones and surprising hints. I sent snippets of all these yarns to Germany. They came back in little packets – use, don’t use, use a little, use a lot more – plus extra thoughts on sparkle and depth and possible highlights. A few colours went out, a few more came in. 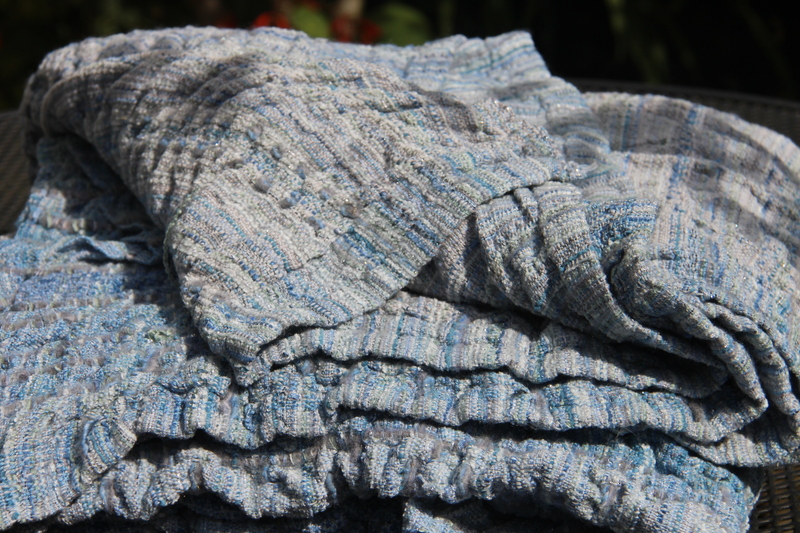 The yarns were a jumbled collection of cottons and linens, chenilles and silks and glittery metallics, plus wools to hold them all together. I sampled. The first two samples were not to my liking but perhaps my client might like them so off they went to Germany with a request for feedback even if it was all negative. We needed to start somewhere on design ideas. I had my own ideas but I could tell that this client had some of her own too. The response was more than I could have hoped for. 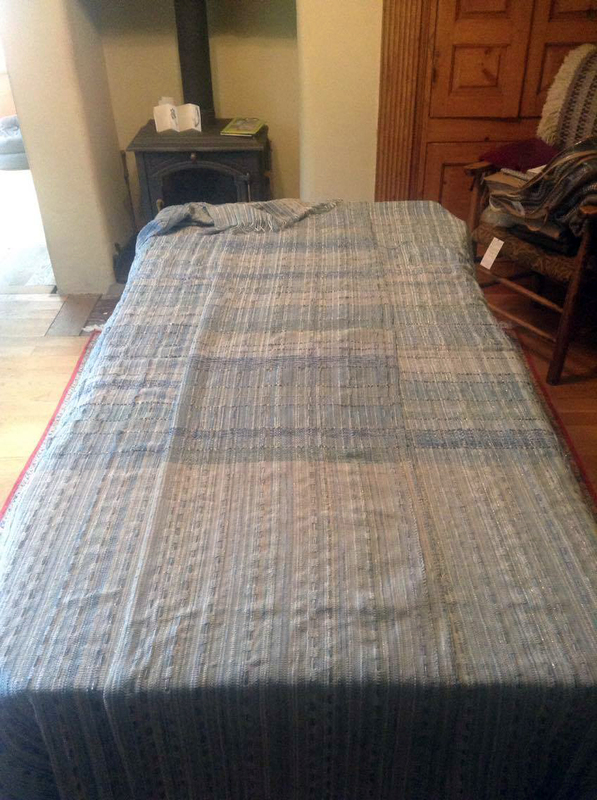 The first response matched my own thoughts – the pattern was too small, the fabric was not sufficiently textured and it felt too dense and heavy when extrapolated out to a throw-sized piece. But most rewarding was the receipt of more photos, this time of some of my client’s favourite fabrics – an old Flemish tapestry and a Japanese kimono of Itchiku Kubota. My imagination was triggered. 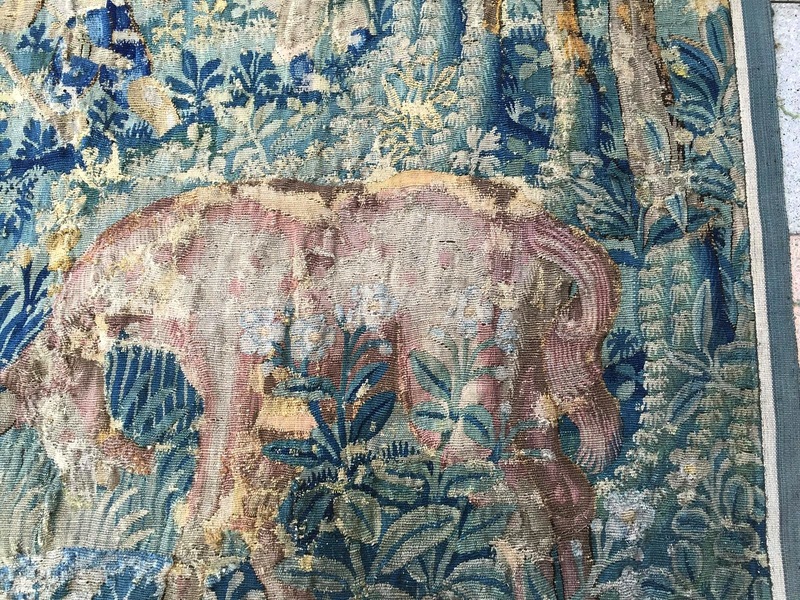 The old tapestry was worn in places but retained its vivid colour in others. 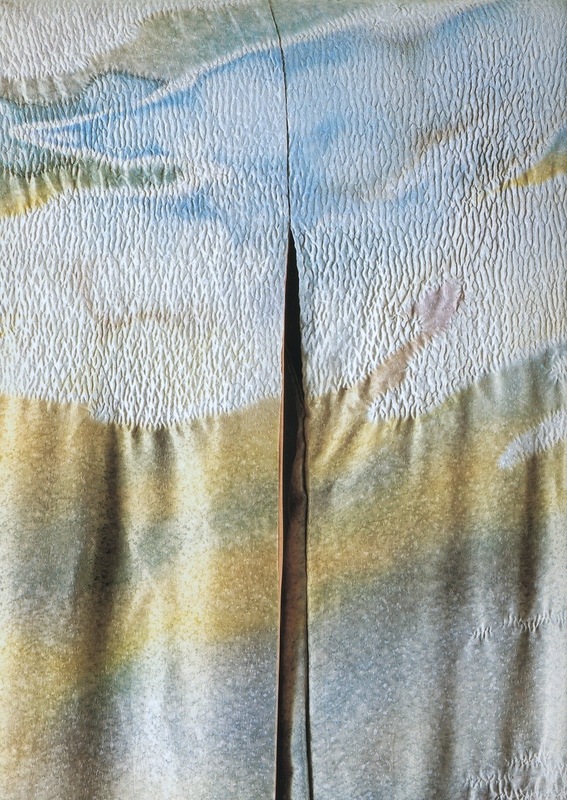 The kimono showed, in the words of my client, “a fascinating synergy between a choppy area with a calm area”. Both were hinting at what she described as “more anarchistic movement” – in other words she wasn’t after a flat fabric with no life in it! I was reminded of an exhibition I had seen in 2015 at the Dovecot Gallery in Edinburgh of Kwang Young Chun‘s Aggregations alongside the work of Bernat Klein. The work of both artists used vivid colours and highly textured surfaces but the entirety of their works were very carefully and thoughtfully pieced together. Could I produce something along the same lines in a handwoven fabric? I got to work on another set of samples and off they went to Germany. 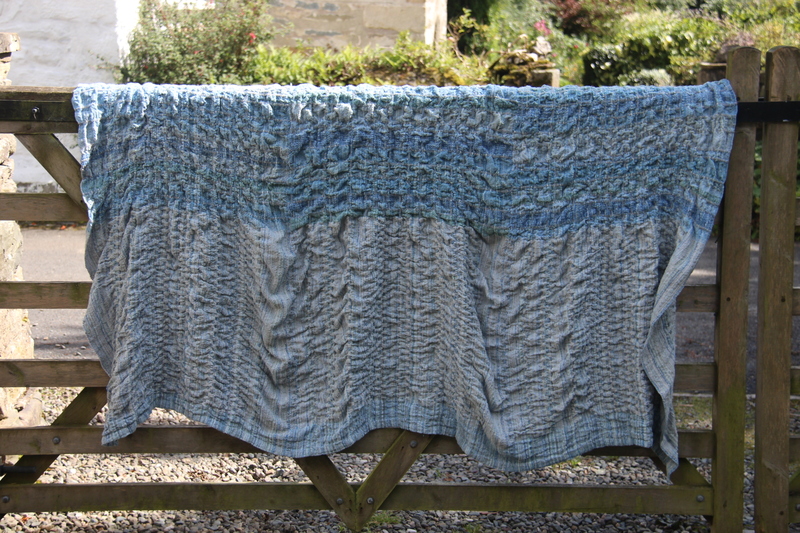 This time I made two very different samples, using the same warp but two quite different approaches, to create one brighter more textured piece and one calmer, softer piece. Still with the beautiful colours of Fledi’s eyes as the central theme. Yes! was the definitive answer in return, a mix of the two would be wonderful. Now I really had set myself a challenge! To weave my throws requires about 12m of warp set on my loom at approximately 1.2m in width. I create three panels which are then sewn together before the entire piece is washed as a single entity. The overall shrinkage is around 30% – 40% in both length and width so there is a lot of weaving required in order to reach the desired finished length and width. Where there is a pattern involved this has to be repeated in exactly the same way for each of the three panels, so that when the woven fabric comes off the loom and the three pieces are aligned the pattern will match across the seams. It involves a lot of careful measuring as the weaving progresses. The next challenge was finding sufficient yarn in the required colours. 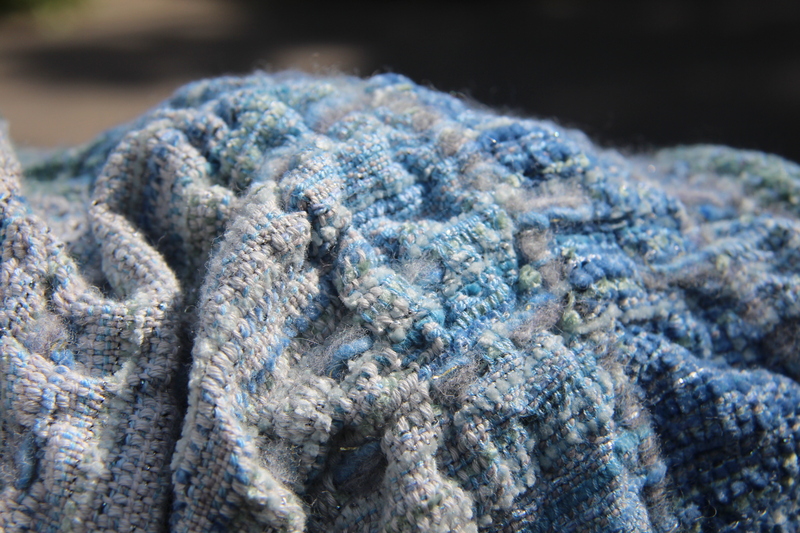 My throws are an eclectic mix of mill ends and repeatable yarns. I am a certified yarn-aholic and love nothing more than diving into my colourful stash to see what else I can use when I run out of that perfect mill end which now, of course, can’t be found for love nor money. Many of my yarns were a bit too fine so I started winding them on bobbins as two or three strands of different colours and different mixes, such as silk and cotton. In doing this I was able to create new subtle colours which allowed me to blend my weft colours. I have always considered weaving to be a form of painting. When you haven’t got exactly the right colour in your stash blending yarns like this can often provide the answer. It became an interesting exercise to see just how many variations of blue I could create from only six or seven options. I finally finished the weaving and set to on the sewing. It took hours, stitching up the side seams then hemming along the top and bottom. The whole piece was over 2.4m square before it went into the washing machine. It tumbled off my dining room table in great heaps of fabric. But eventually it became one single entity and the whole piece went into the washing machine followed by the tumble dryer. It’s a heart-in-mouth moment and I always start with the gentlest wash and the shortest amount of time in the dryer. If necessary I can wash it all again but if you overdo it the first time you’ve lost the fabric and the hours of work that went into creating it. The finished piece is a triumph in my eyes – areas of peace, areas of calm, an agitated tension and above all it rejoices in the colours of Fledi’s eyes. I was delighted. My client was over the moon. And now we’re planning another collaboration, I can’t wait!